How a secret postcard sale held in the Deutsche Bank Wealth Management Lounges at Frieze London and Frieze Masters raised £150,000 for charities that support vulnerable women. On 4-7 October, some of the world’s most cutting-edge and contemporary art descended on London’s Regent’s Park as it hosted two of the most significant events in the international art calendar, Frieze London and Frieze Masters. This year, the 15th consecutive year Deutsche Bank has partnered with Frieze, was particularly noteworthy, as it marked 100 years since women received the right to vote in the UK and Germany. Deutsche Bank Wealth Management teamed up with Tracey Emin and her studio, with support from Deutsche Bank’s Art, Culture & Sports division, to create an exhibition that celebrated a century of female political empowerment. Part of the exhibition was a new and exciting initiative: a secret postcard sale, which has raised over £150,000 for charities that support vulnerable women. Inspired by the annual sale of postcard-sized works at the Royal College of Art, where she studied, and the numerous postcards used as part of the suffrage campaign, Tracey Emin reached out to the living female artists in the Deutsche Bank Collection. She asked them to contribute an original piece of work and the response was fantastic: a total of 231 artists donated over 800 postcard artworks, which went on sale for £200 each. The identities of the artists, many of them highly celebrated, were only revealed once the postcards had been bought. Around half of the postcards were on display and sold in the Deutsche Bank Wealth Management Lounge at Frieze London, with a new selection put out each day. There was a real buzz and excitement around the sale, reflecting the unique opportunity to acquire an original piece of art. The other half of the postcards were made available to the public via an online sale. All the money raised will go to five selected charities: Bromley & Croydon Women’s Aid; Havering Women’s Aid Ltd; Oasis Domestic Abuse Service, Margate; StreetTalk, Lambeth; and The Maya Centre, Islington. Deutsche Bank has established the Tracey Emin & Deutsche Bank Centenary Fund to distribute this money and to support the charities for the long-term. What happened in the Deutsche Bank Wealth Management Lounges? 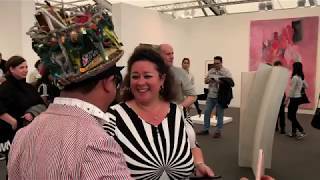 Another World was the title given to the exhibition curated by Tracey Emin and her studio that showcased around 60 works by female artists in the Deutsche Bank Collection and spanned both of the lounges at Frieze London and Frieze Masters. Stepping into the lounge, guests were welcomed into another world; the walls, floor and soft furnishings were all dark red. One of Tracey Emin’s signature neon signs spelling out Another World hung above the doorway to the fair, encouraging guests to continue their adventure into the world of contemporary art. The inviting atmosphere in the lounges made them spaces where guests could not only connect with the art surrounding them, including works by Louise Bourgeois, Rosemarie Trockel and Marlene Dumas, but also with each other over a shared interest. Frieze London and Frieze Masters 2018 had record attendance, with the former bringing together 160 of the world’s leading galleries and the latter some 130 exhibitors. This year’s Frieze Stand Prize was awarded to Sprüth Magers gallery of Berlin, London and Los Angeles for its outstanding gallery presentation which included works by Thomas Demand, Jenny Holzer and Marcel van Eeden. The theme of female empowerment continued from Another World into the fairs, particularly Frieze London’s Social Work section which centred on the 1980s and gathered women artists who use their work to challenge social norms and take an activist approach. Frieze has announced the launch of a new annual contemporary art fair in Los Angeles, which will premiere in February 2019. This additional event joins Frieze London, Frieze Masters and Frieze New York in the Frieze Art Fair calendar, reflecting Los Angeles’s thriving cultural scene. Deutsche Bank is delighted to extend its partnership with Frieze in Los Angeles, continuing a shared commitment to discovery and artistic excellence. Suzie Bliss is an editor in the global content team at Deutsche Bank Wealth Managment. It's going to make a lot of difference to very vulnerable women's lives.